Home > Law Books > Treatises > Handling Business Tort Cases, 2015 ed. 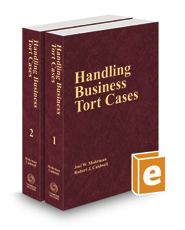 Handling Business Tort Cases, 2015 ed. Handling Business Tort Cases is a comprehensive manual for lawyers who litigate cases involving business torts, defined as torts that arise from the provision of goods and/or services to others or to the improper interference or hindrance of such provisions of goods and/or services.